The first step to introduce children to computer science is to participate in the Hour of Code, the largest learning campaign in history. In one hour, students (and teachers) can learn that computer science is fun, easy, and accessible at all ages. Whether you're a school teacher, an administrator, an after-school teacher, or a volunteer, Code.org provides educational resources for all ages, free of cost. Here are the computer science fundamentals for elementary school. Course 3. Students will delve deeper into programming topics introduced in previous courses to flexible solutions to more complex problems. By the end of this course, students create interactive stories and games they can share with anyone. Recommended for grades 4-5. Course 4 is designed for students who have taken Course 2 and 3. Students will delve deeper into programming topics introduced in previous courses to flexible solutions to more complex problems. 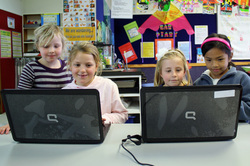 By the end of this course, students create interactive stories and games they can share with anyone. Recommended for grades 4-8. Let's learn how to code our own game and share it with our classmates, parents and teachers_ to play! See what Common Sense Media says about Tynker! BrainPOP describes a computer as "a machine that stores and processes information and can be programmed to carry out instructions. 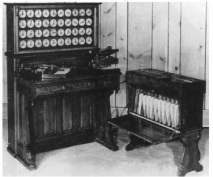 The first programmable machine was invented in 1801. It was a machine for weaving cloth called a loom. The loom was strung with punched cards that let colored thread through to form different patterns". Punch cards were later used to store numbers and other data then fed through punch card machines. The government used punch card machines to count how many people there were in the United States in 1890. In the 1900's, computers started to improve. 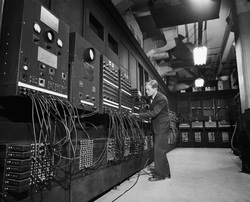 A number of machines could claim the title of "first computer" depending on your definition of the word 'computer'. Alot of the early computers were built by hand, so each machine was one of a kind, really expensive and fragile. These early computers were huge, taking up whole rooms that had to be specially air conditioned to the computer would not overheat. In 1959, miniature electronic circuits were invented. This meant that millions of transistors, the switches that control the flow of electricity in a computer, could be mass produced. Transistors were tiny compared to the vacuum tubes they replaced. Computers became even smaller and more powerful with the invention of the microprocessor, a chip that could hold thousands of transistors and other electrical parts. This made computers small, cheap, fast and affordable for everyone. By the 1970's, there were hand held calculators that were more powerful than those room sized computers of the 1940's. Microprocessors kept getting smaller and now millions of transistors can fit on a chip the size of a finger nail! Computers have worked their way into other technologies too from household appliacances, to cars, to toys. Computers are likely to get smaller, faster, cheaper and more powerful for a long time.